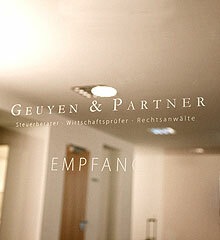 GEUYEN & PARTNER has compiled and reviewed the content of its website with utmost care. Nevertheless, it cannot assume any warranty or liability of any kind for accuracy, currency and completeness. This also applies for all links placed within the website. GEUYEN & PARTNER has no control of any kind over the current and future design and content of linked sites. Therefore, the firm expressly distances itself from any illegal or immortal content in linked sites. Sole liability for illegal, erroneous or incomplete content, and particularly for damages arising from the use or non-use of information offered via links, rests with the provider of the referenced site, not GEUYEN & PARTNER, which merely referenced the publication by placing the link. This website contains non-political news having to do with tax, social and economic law, directed primarily towards clients of GEUYEN & PARTNER. The author of this website will attempt to keep the information offered complete, accurate and up-to-date, to the best of his knowledge and conscience. Nevertheless, the author is not responsible in any way for damages which arise from use of the offered information, even if such damages are attributable to the use of incomplete or erroneous information. Liability for the content of linked sites is excluded, especially since the author has no control over the content of linked sites. The content of sites which are referenced on this website is solely the responsibility of the providers of those third-party websites, not that of the provider who references third-party publications and content by placing a link on its website. If linked sites (especially if content is modified after the links are placed) contain illegal, erroneous, incomplete, insulting or immoral information and the author of this website is informed about such content on the linked sites, the author will immediately remove the link. The content of this website which was created by the author is copyrighted. This information is intended for personal use only. Any use in violation of copyright law of any content of this website, particularly publication, reproduction and use for commercial purposes in any form, as well as communication to third parties, even in extract or revised form, without the express consent of the author, is prohibited. The information in this website may be modified, removed or supplemented without prior notice. Accordingly, the author cannot guarantee the accuracy, completeness, quality or currency of the information provided.